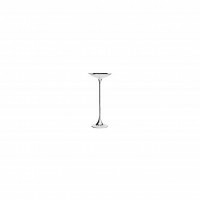 Loop is a real all-rounder and can be wonderfully adapted for many uses in all living areas. It features delightful elegant wood connections and meticulous details. The core design element consists of two rings, connected by means of a link. Bevelled surfaces in the underside of the table top and on the upper side of the base plate give loop a slim and light visual appearance that is surprising for this material thickness. 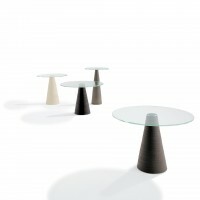 The table top insert can be selected in leather or coloured glass.